You are currently browsing the The Pet Product Guru blog archives for the day Friday, September 17th, 2010. After your dog has surgery such as being spayed, it’s important to keep her from licking the wound because she could remove her stitches or cause an infection. Unfortunately, dogs instinctively want to lick their wounds so you may need to take some precautions. If bandages and topical pet medication and products don’t do the trick, try an Elizabethan collar. 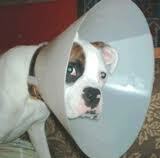 This is cone shaped and fits onto your dogs collar wrapping around her head like an upside down lampshade. Your dog may find this contraption bothersome but it will help keep her from licking and aggravating her incision site. To make the situation less stressful, you can remove the collar when you are able to keep an eye on her.